Now that I have time to catch up here is a short report about our time in Indonesia with Buzz Off. Our purpose was in going to Indonesia was to not only train locals in how to deal with malaria at a local level, but to train trainers who could continue the work. The training was held in Papua. 80% of Indonesia’s malarial deaths occur in Papua. Four of us went across run this newer version of Buzz Off two from the Netherlands and two from Australia. Prior to our arrival, we have a team translating the resources we use into Indonesian. So once we were there we had an abundance of stuff available for the students and the trainee trainers. In our time off we spent many hours rewriting out training manual so at the end of the time we in Indonesia our most basic resource – our training manual had also been completely reviewed and updated. Week one of training saw 34 malaria volunteers trained. Week two saw 18 of these volunteers trained as trainers and week 3 saw them run training seminars under supervision in local communities. 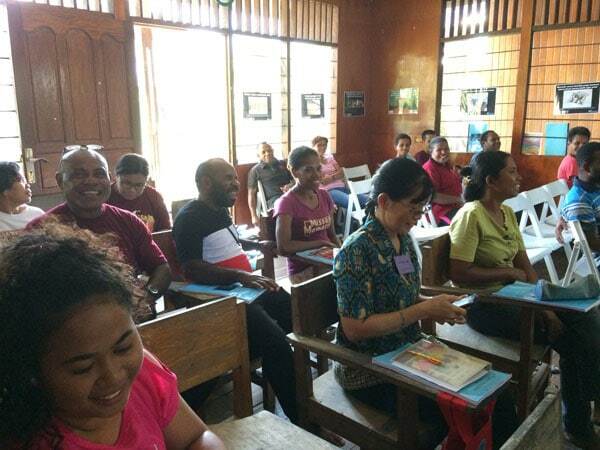 This outreach was an amazing success and we now have a training team in place in Papua. We are now translating more resources and the training team is looking at going into remote villages to do training there. We are now at the point where we are raising funds for mosquito nets and testing kits for this team to use. Donations can be made here. Buzz Off saves lives … we are very pleased with the results from Papua and look forward to the increased effectiveness as they get the malaria message out. God cares about the healthcare problems that exist in remote communities. Malaria, HIV and TB are the big three that are wiping out millions of lives around the globe every year. Please pray for Buzz Off as we are struggling to get funds in for our November training in southern Myanmar. I want to say a big thank you to those who support me and those who contributed towards my fare to Indonesia. This was money well spent. Thank you.